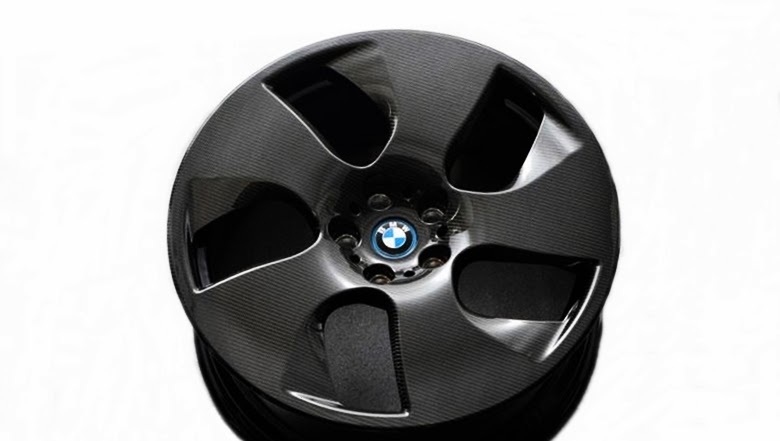 BMW carbon fiber rims - BMW will use full carbon fiber for rims on their vehicles. Technology ultra-lightweight carbon fiber has been developed on the BMW i3 and i8 are made by an Australian company, Carbon Revolution (CR), has been introduced at the Innovation Days 2014 in Munich. Carbon fiber rim of BMW claimed weighs 25 percent lighter than aluminum rims and 10 percent lighter than other carbon fiber rim. BMW will use carbon fiber on: full carbon fiber for rims, full carbon fiber steering wheel, and one-piece carbon fiber propeller shaft. Propeller shaft claimed 6.6 pounds lighter than steel, which can minimize friction. These components will be used in the M3 and M4. The technique of making carbon fiber rim for BMW, which is in the making by the "Carbon Revolution" claimed to be the first carbon fiber rims are made using forged technique. With forged technique, the resulting component will be much stronger and smoother. With use of full carbon fiber will produce a vehicle that is much lighter and much better fuel efficiency. Carbon fiber wheels have very good strength, but still questioned for long-term use, the carbon fiber wheels will have staying power for the long term? Carbon fiber for the rims had been used on the Citroen SM, with a mixture of carbon and resin in 1972. While Full Carbon fiber for the rims, Weds Sports has introduced the pure carbon fiber rim in 2008, on the CR-9 Shelby Ultimate Aero. "Article : BMW carbon fiber wheels preparation for production"